We are pleased to bring you the flavorful experience of organic apple peel in a satisfying, organic powder that is perfect as a phytonutrient-rich daily dietary supplement: Health Ranger Select Organic Apple Peel Powder. Apple peels are the "superfood" part of every apple, and they make a powerful nutritional addition to any recipe. Use this delicious powder to naturally enhance the flavor of smoothies, sweeten tea, spice up your morning oatmeal or as a delicious addition to jams and jellies. Mix with organic fruits of all kinds for a natural snack. 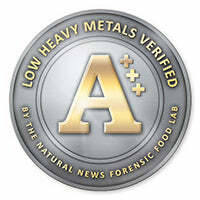 Health Ranger Select Organic Apple Peel Powder is USDA certified organic and lab-tested for pesticides and heavy metals. It's made entirely without synthetic chemicals, artificial sweeteners, preservatives or additives of any kind (it's simply 100% organic apple peel grown in Canada). The perfect "superfood" powder -- even for kids' recipes and smoothies -- our organic apple peel powder is rich in healthy polyphenols and flavonoids. It’s a great source of vitamin C and A, and it's 100% sourced from Canada (nothing from China). Health Ranger Select Organic Apple Peel Powder is processed at low temperatures (below 116 degrees Fahrenheit) to preserve those precious nutrients and enzymes. Our apple peel powder contains 2-6 times more nutrients than apple flesh, plus higher concentrations of phenolic, flavonoids, and quercetin than the apple flesh. It's low-temperature processed to retain its vital nutrients.